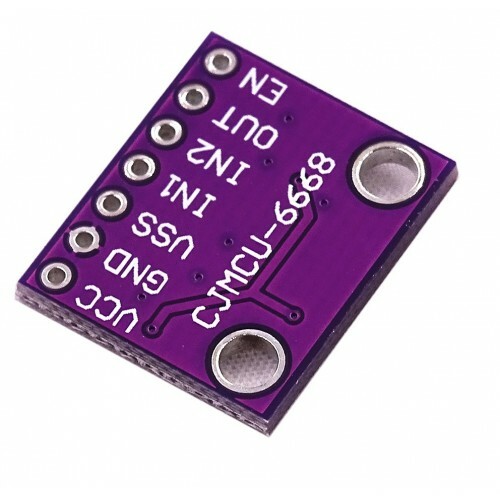 This module is based on Analog Devices LTC1966 single supply RMS to DC Converter IC. The internal delta-sigma circuitry to use,more accurate, lower power and dramatically more flexible than conventional log-antilog RMS-to-DC converters. The LTC1966 accepts single ended or differential input signals (for EM/RFI rejection) and supports crest factors up to 4. Common mode input range is rail-to-rail. Differential input range is 1 Volt peak, and offers unprecedented linearity. Unlike previously available RMS-to-DC converters, the superior linearity of the LTC1966 allows hassle-free system calibration at any input voltage. LTC1966 also has a rail-to-rail output with a separate output reference pin providing flexible level shitting. The LTC1966 operates on a single power supply from 2.7 Volts to 5.5 Volts or dual supplies up to ±5.5 Volts. A low power shut down mode reduces supply current to 0.5uA. The LTC1966 is insensitive to PC board soldering and stresses, as well as operating temperature.